Dr. MJ Redman is a board-certified veterinary dentist who has practiced at Mission Veterinary Specialists in San Antonio since 2014. 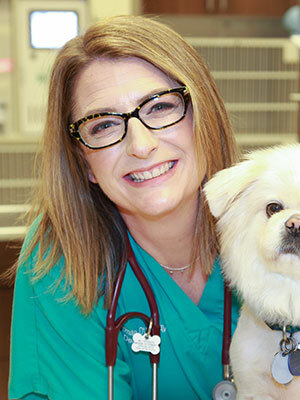 She is a proud graduate of WSU College of Veterinary Medicine and worked in general practice in Arizona and Washington before specializing in dentistry. Dr. Redman serves on committees for the American College of Veterinary Dentistry and the Foundation for Veterinary Dentistry. She lives in San Antonio with her 2 dogs and 3 cats. In her free time, she is a competitive trail and ultra runner and volunteers at local races as well as at Government Canyon State Natural Area. Most veterinarians (myself included) received little to no education on the subject of dentistry during veterinary school. Every day our patients come in with oral pathology that has gone unrecognized and untreated. Many oral problems can be diagnosed during a physical exam simply by lifting the lip while others cannot be diagnosed without general anesthesia or dental radiographs. This presentation will focus on common oral pathology that can be identified or suspected during a routine physical exam and will be divided into problems that are more likely to be found in juvenile animals (those with deciduous teeth) and those that are more likely to be seen in adult animals. Topics covered will include malocclusions, persistent or fractured deciduous teeth, fractured or discolored adult teeth, tooth resorption, periodontal disease, caries, stomatitis and oral masses. 3. Learn how to discuss the exam findings and recommended diagnostic or treatment options with owners.